Traces of particle collisions are illustrated in this graphic from the European Organization for Nuclear Research. 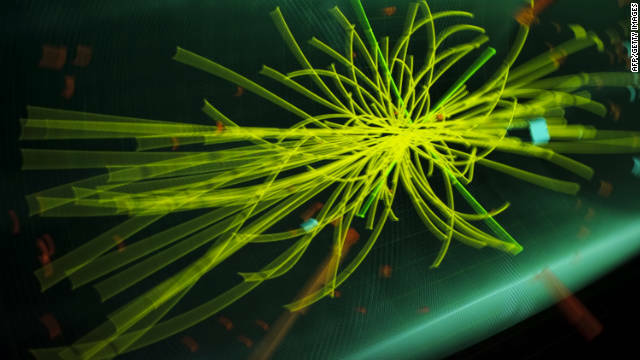 Scientists said Tuesday that they’re a little bit closer to answering one of the biggest questions of particle physics: Does the so-called God particle exist? Gathering in Geneva, Switzerland, experts from around the world revealed results of their search for the particle – known officially as the Higgs boson - using the Large Hadron Collider, the world’s largest atom smasher. Scientists at Tuesday's event said they had made strides in their search for the Higgs boson but did not have strong enough conclusions to claim a discovery. The collider fires together protons, which are positively charged particles that make up all atoms that can interact in many different ways. Scientists are looking very closely for a "Higgs bump," which is "literally a bump in a graph which will pop up and say, 'that's it!' " said physicist Martin Archer of the Imperial College of London. Two groups of scientists worked independently on different parts of the hydrogen collider to watch and analyze the particle collisions. Scientists say Higgs boson particles won’t be discovered by actually observing the particles themselves. They will be discovered by observing how other particles react to them. The Standard Model is the theory physicists use to describe the behavior of fundamental particles and the forces that act between them. It describes the ordinary matter from which we, and everything visible in the universe, are made and does it extremely well. 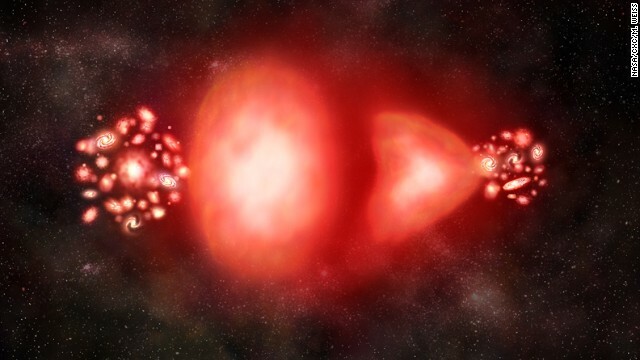 Nevertheless, the Standard Model does not describe the 96% of the universe that is invisible: so-called Dark Matter. 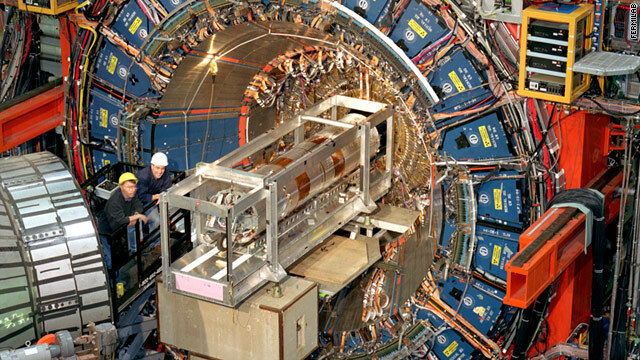 One of the main goals of the collider's research program is to go beyond the Standard Model, and the Higgs boson could be the key, CERN scientists explained. “The very good news that we know from today that in the next year, it’s very likely we might get an answer that we could consider solid,” Tonelli said. 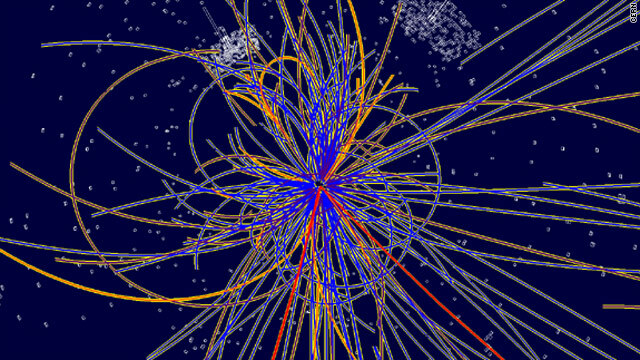 A simulation for finding the Higgs boson. 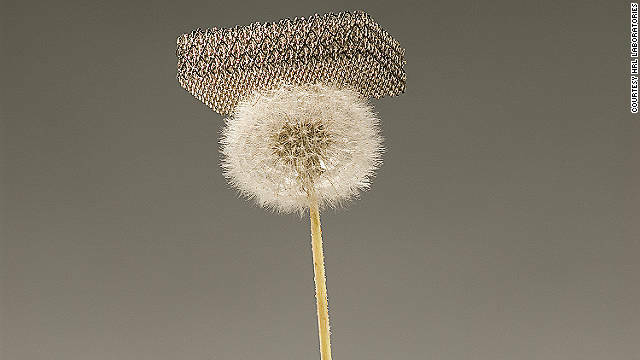 HRL Laboratories announced it has created the world's lightest solid substance, seen here sitting atop a dandelion. It was a simple e-mail. But with just a few words, it capsulized the exact moment of an exciting scientific discovery. "Check out the world's lightest material: 0.85 mg/cc!!" scientist Toby Schaedler wrote to his teammates at HRL Laboratories in Malibu, California. "It is holding up fine even after I squeezed it a little." Six months later, HRL is announcing its discovery for the first time in a study published in November's Science magazine. When Light Years talked to physicist Bill Carter and project manager Leslie Momoda, the giddiness of inventing the lightest solid substance hadn't yet worn off. They were, well, practically floating on air. In the search for answers to some of the most mysterious and fundamental questions about the the universe, Europe's $10 billion particle-smashing Large Hadron Collider has been hogging the spotlight in recent years.